Type: Specially formulated mild scouring paste. Contents: 0.3 fl. oz / 9 ml jar. Price: £6.99 each. £5.50 each if you buy two or more. Postage and packing included. Also known as: Electrical contact polish, corrosion remover, battery spring cleaner, battery contact cleaner. Corrosion Gone! 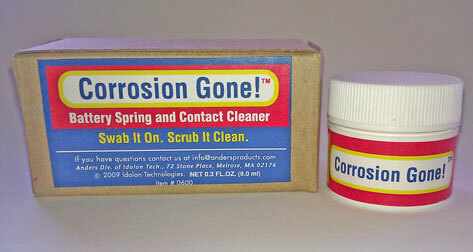 brings you specially formulated corrosion removal paste in a conveniently sized, and low-priced pot. Available at a fraction of the price of competitive products which are typically not nearly as effective and only available in excessively large quantities. Cleans up corrosion on computer boards and other PCB's caused by leaking memory backup batteries or leaking electrolytic capacitors. Rejuvenates battery contacts on all types of battery powered equipment including toys, cameras, radios, mobile phones and anything else that runs on batteries. thoroughly stir jar of Corrosion Gone! carefully discard used swabs etc, remembering that contents of some cells (especially Mercuric Oxide and Nickel Cadmium are environmentally unfriendly and toxic so dispose with care). © The Small Battery Company 1999 - . All Rights Reserved.